The WA Ballet was in need of a new dance training, administration, wardrobe and set production facility. It would become home to physical and artistic triumphs, passion, creativity and long days of gruelling work. And with its high ceilings, wooden floors and grand, classical structure, the heritage-listed former Institute for the Blind was just the place to start. 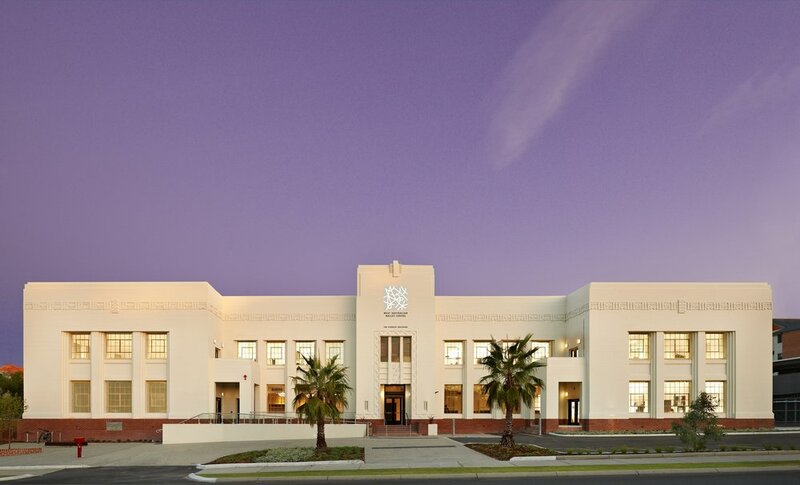 The Institute had stood in Maylands WA for over 100 years and was in need of extensive repair and refurbishment. So, with the help of an broad team of consultants, we set about restoring the building closer to its original state after a failed apartment development there saw much of the character lost. However, in order to become a world-class dance facility, the building would need more than restoration. We also designed new elements to meet the highly technical needs of the WA Ballet dancers and staff, such as acoustic attenuation, easy movement of pianos and cumbersome props, and prevention of dancer injury. Great care was taken to ensure these new additions did not take away from the feeling of the original space. A spring in their step. In order to prevent dancer injury, we created one of the world’s most advanced sprung floor systems – in the 100-year-old section of the building over the original Jarrah timber floor structure. The floor was successfully installed with a large team of consultants, product suppliers and contractors, and the WA Ballet are reporting fewer injuries. The WA Ballet Centre was the winner of the Adaptive Reuse Category in the WA Heritage 2013 Awards. It was also submitted for the prestigious UNESCO 2013 Cultural Heritage Awards. Another consideration was the WA Ballet’s dependence on grants and donations. We sought to minimise the long-term maintenance and lifecycle costs of the building, and flexibly designed some areas of the building for any future additions. We also made the building more accessible to the whole community, and safer in case of emergencies, by adding a new main stair, ablutions block and lift. The centre can house functions, classes, community events, and has even been used for a wedding.